DoseSpot is a method of sending electronic prescriptions in Open Dental. It is an internet based, secure ePrescribing system. DoseSpot integrates with Open Dental using a program link and offers two-way medication syncing. eConnector and an active support plan are required to register. Note: You must have the eConnector installed. Make sure it is installed before beginning DoseSpot setup. See eConnector. Part 1: Enable DoseSpot Program Link. Part 2: Fill out Clinic/Practice and Provider registration forms. Enter the Clinic Key and ID. Part 5: Complete Identity Proofing. Practices using Legacy eRx can choose to switch to DoseSpot (recommended) or continue using Legacy. Once DoseSpot is enabled, there is an option to keep Legacy eRx enabled to allow you to continue sending prescriptions electronically while the DoseSpot Identity Proofing process is underway. Once you have completed the transition to DoseSpot for all needed providers, call Open Dental support to cancel Legacy eRx. In the Open Dental Main Menu, click Setup, Program Links. If available, select DoseSpot as the eRx Solution. If you are in the process of switching to DoseSpot from Legacy select DoseSpot with Legacy. Note: You will need to check the Allow Legacy eRx Option in the Provider Edit Window to allow continued use of legacy per provider until DoseSpot identity proofing is complete. Designate a Practice Administrator for EPCS registrations (cannot be a doctor). Complete the DoseSpot Registration Form. Note: For each additional provider, use the same form and uncheck Clinic at the top. Each provider submitting electronic prescriptions needs to submit a Provider form. The practice administrator will receive an email containing the Clinic Key, Clinic ID, DoseSpot User ID, and Practice Administrator registration. This could take up to two business days to receive. The following instructions are for the first clinic you register. For subsequent clinics, see the Additional Clinics section below. Double click on electronic Rx. Double click the Headquarters clinic to open DoseSpot Property Edit window. Enter the provided Clinic Key and Clinic ID. Once these fields are entered they cannot be edited. If clinic information is missing, click Setup to open the Edit Clinic window and enter required information. Open Dental will automatically insert the DoseSpot User ID into the DoseSpot User ID field of the User Edit window only for providers. Providers will be notified via an eRx Alert when registration is complete. The practice administrator must manually enter a DoseSpot User ID for non-doctors and providers with multiple ID numbers. See Part 4. Additional Clinics: Once DoseSpot is enabled for the Headquarters clinic, registering additional clinics is easy. There is no charge for additional clinics. In Open Dental, click Setup, Program Links. Double click the clinic you wish to register. Click Register Clinic. 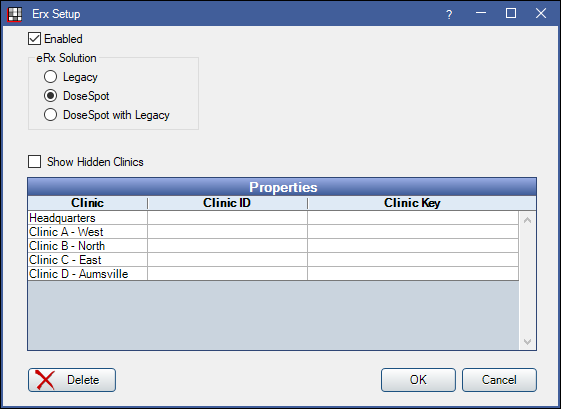 The Clinic ID and Key fields will populate. In the Chart module, click eRx. This notifies and updates Open Dental Headquarters. Non-doctors must be enabled manually. Below are the steps to complete this process for non-doctors. This process can also be used for providers in the event a provider DoseSpot User ID was not automatically entered in the DoseSpot User ID field. Enter DoseSpot User ID to Send ePrescriptions: This is required for each provider and non-doctor who will be sending ePrescriptions. Once you receive a DoseSpot User ID, in Open Dental, click Setup, Security Settings (Global Security Settings). Double click the user to open the User Edit window. In the DoseSpot User ID field, enter the DoseSpot User ID. Click OK.
For providers with multiple DoseSpot User IDs (e.g. for different clinics), click [...] to enter a number per clinic. The provider and non-doctor(s) may now access DoseSpot. Important: Identity Proofing is typically completed for each provider upon first launch of DoseSpot. In the event Identity Proofing was not completed, follow the steps below. This process only applies to prescribing providers. Each prescribing provider must complete identity proofing before sending ePrescriptions. In DoseSpot, click the Walk Me Through menu item in the lower right. Follow the steps on the screen to complete identity proofing. You will create a PIN. This PIN is required every time an ePrescription is sent. You will receive a letter in the mail (your home address) from Experian that contains your Session ID needed for EPCS registrations. There are two parts to register for EPCS. Your practice administrator is designated during the Sign Up for DoseSpot process above. 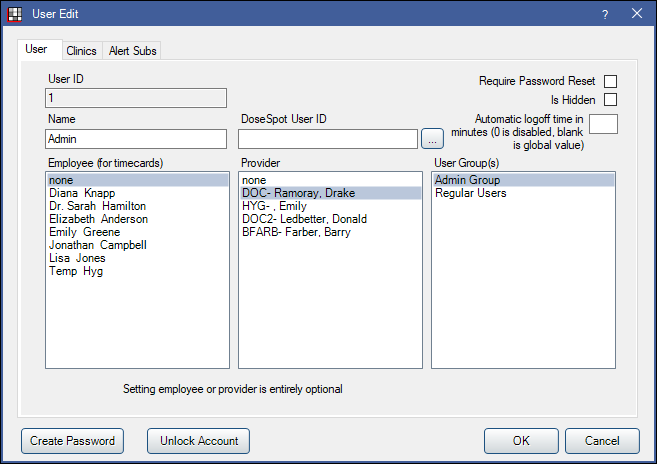 This person will access the Administration Console in DoseSpot and enable EPCS for the registered provider(s). In a web browser, navigate to http://pss.dosespot.com/Admin. Enter login information. Login information is sent via email when the clinic is registered for DoseSpot. 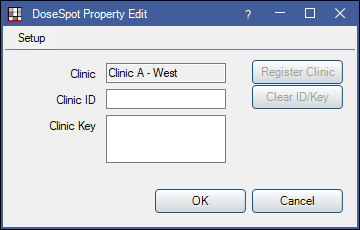 In the Administration Console, click Edit on the provider/clinician to enable EPCS. Under TFA Authentication, check the EPCS/TFA Activation box. EPCS registration is required in order to submit electronic prescriptions for controlled substances. You will also need to download the Duo Mobile App from the Google Play Store or Apple App Store. Log into Open Dental as the provider who activated EPCS/TFA. In Open Dental, select a patient. In the Chart module, click eRx to open DoseSpot. Click the notification alert in the upper left. TFA Authentication window will pop up. Enter the Credential ID generated from the Duo Mobile app. Do not include spaces. Enter the Session ID from the Experian letter. Enter the displayed 6-digit code from Duo Mobile app into the TFA Code field on the computer. Enter in the provider's PIN created during the IDP setup process. You can now send both controlled and non-controlled substances electronically. EHR Incentive Program: DoseSpot has superior features to Legacy eRx, but ePrescribing for the EHR Incentive Program is only possible with Legacy eRx - Comprehensive. If you have a new phone and are currently using the VIP Access App, and you still have access to your old device, you will need to deactivate your old device and activate your new device. If you do not have access to your old device, please contact Open Dental support. Close out of DoseSpot if you have it open. The DoseSpot admin (designated by the DoseSpot admin email in the commlogs) will need to login to the admin console http://pss.dosespot.com/Admin. The DoseSpot admin will click Deactivate in the TFA Authentication section. The DoseSpot admin will click Save. The provider will log into Open Dental, then select a patient and click eRx in the Chart Module. The provider will click the blue ! at the top of the screen. The provider will be prompted to click Deactivate TFA Authentication. The provider will enter their Credential ID, TFA Code, and PIN (from their old phone). To activate your new device, follow Part 2: Activating Your One Time Passcode (OTP) Device (see above). If you have a new phone and are currently using the Duo Mobile App, you will not need to deactivate your old device in order to activate your new one. Select the Re-Send DUO Mobile button in the TFA Authentication section. Enter the new phone number. Select the text messages that need to be resent so the provider can download and enable their Duo Mobile app.